**Winner of the 2016 Watty Awards in Visual Storytelling, and officially a Wattpad Featured Novel! ** Two juniors in high school, each fresh out of a breakup, thousands of miles away from each other. Connor Hall and Sydney Porter didn't expect anything to happen when they were assigned to be each other's pen pals at their respective schools, yet feelings can emerge from anything, even simple letters. 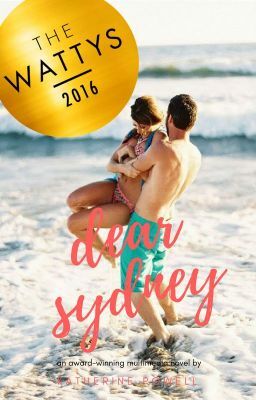 Written completely in notes, texts, and social media posts, Dear Sydney is a modern take on the conventional love story, proving that you don't have to be close in miles to be close in your hearts. Highest Rank: #18 in Teen Fiction on 4/12/17 Chapter 1 published 4/24/16 Last Epilogue published 8/15/16 © 2016 Katherine Powell McCafferty All rights reserved. No part of this document may be reproduced or transmitted in any form or by any means electronic, mechanical, photocopying, recording and so on without prior permission of the author. Any unauthorized copying, broadcasting, manipulation, distribution or selling this novel constitutes an infringement of copyright, which is punishable by law.